Walnut is a stunning timber and as this project shows, is a great choice for a handrail; it carves beautifully and takes a fantastic finish. 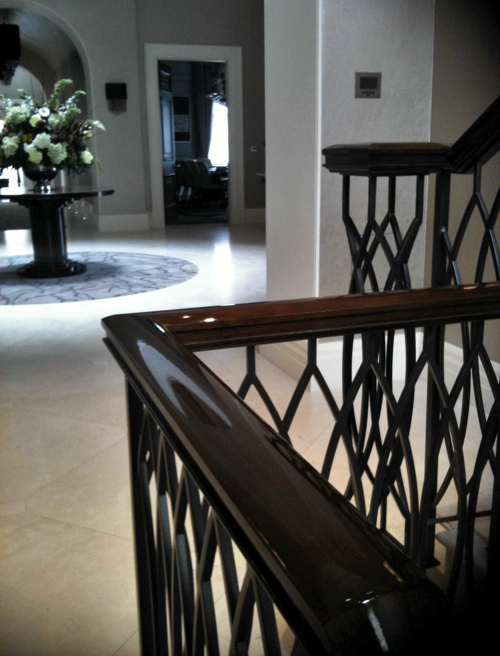 This handrail spans 4 floors of a very large house in Kenwood, London. In addition to the main handrail, the top two levels have circular sections cut through the center of the floors and these are also surrounded by the handrail. It means that a huge amount of timber was used and required some very skilled joinery by John Barnes Joinery to construct it. At around £50k for timber alone it deserved a decent finish, unfortunately though, it was initially finished with wax which left it looking pretty dull and flat, certainly not the center piece it should have been. Unless wax is built up over a very long period of time, it’s not the best way to finish a handrail. We were called in to come and give it some life and a more appropriate finish. The below images are the results of the handrail after we stripped all the wax off, stained it and re-polished with French polish. It looks fantastic now and is a really striking center piece to this building.